IF GRATITUDE is the quintessential conservative virtue, then Thanksgiving must be the quintessential conservative holiday. And with Thanksgiving 2015 comes an additional reason for gratefulness on the right: National Review has turned 60 and is marking the occasion with a grand anniversary issue. 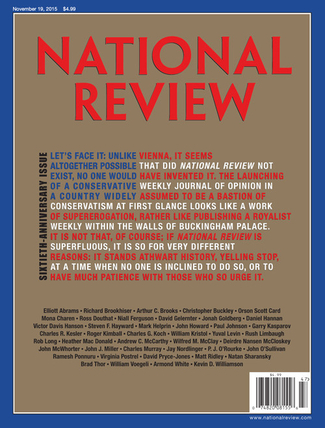 In a column some years ago, I characterized NR, which was launched by William F. Buckley Jr. in 1955, as "the publication that blew the wind into the sails of American conservatism." I wrote of first discovering the magazine as a 17-year-old college sophomore, and of my exhilaration at encountering in its pages "words and arguments that gave shape and coherence to my own inchoate political beliefs," packaged in a style that was "feisty, smart, playful, elegant." Much has changed in National Review's six decades — not least, the dramatic rise of a conservative movement at home and the even more dramatic collapse of the Soviet Union abroad. One thing that hasn't changed, however, is the magazine's commitment to serious ideas, engagingly presented. The anniversary issue is chock-a-block with writing that fits that description, beginning with a letter from editor Rich Lowry (titled, appropriately, "Thankful at Sixty") that recommits Bill Buckley's journal to the high standards and high spirits that have been its trademark from the start. The whole issue is worth reading, but especially appealing are the last dozen or so pages — the section normally reserved for reviews of notable new books. This time it is devoted to notable old books. National Review invited a number of prominent conservative thinkers to reflect on one volume that influenced their lives or helped form their outlook on the world. The books they chose are remarkably diverse, and their short testimonials a tribute to the power of books to indelibly stamp hearts and minds. Not surprisingly, some of the contributors singled out works of overtly conservative exegesis. Charles Kesler, a professor of government at Claremont McKenna College, enthusiastically praised Did You Ever See a Dream Walking?, an anthology of 20th-century conservative writing compiled by Buckley himself. Daniel Hannan, a columnist for the Washington Examiner, recalled his stunned reaction on reading Edmund Burke's famous Reflections on the Revolution in France, first published in 1790 and still "the most penetrating denunciation of revolutionary excess ever composed." Steven Hayward, who teaches at Pepperdine, was stirred by C. S. Lewis's The Abolition of Man, with its prescient warning that societies that fail to uphold the truth of universal moral values eventually descend to the nihilism of "men without chests" — creatures with intelligence and appetite, but no virtue or honor. Some of National Review's contributors celebrated titles I'd never heard of. In one of the most intriguing essays, the Manhattan Institute's Heather Mac Donald recounts how reading a particular book — How To Do Things with Words by J. L. Austin — liberated her from what might have been "a lifetime of delusion." As a Yale undergraduate, says Mac Donald, she had been besotted with deconstructionism, a cynical discipline which held that all texts undermine their own meaning. Then she came across Austin's "lucid, ironic, conversational" book, and realized how credulous she had been. The scales came off her eyes, upending her plans and setting her career on a whole new trajectory. I don't suppose I'll ever open Austin's book. But simply reading of its impact on Mac Donald's mind is a source of pleasure, and an affirmation that anyone who loves books will relish. 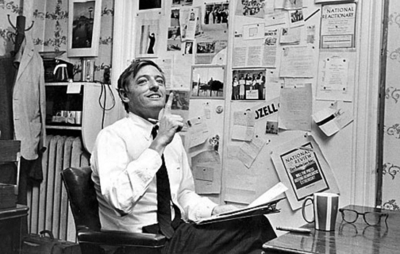 Launched by William F. Buckley Jr. in 1955, National Review operated from a conviction that ideas matter, and that good writing can change lives. Hosts of readers have relished Christopher Buckley's political satires (if you've never read Thank You for Smoking, you don't know what you're missing), so it was startling to learn that when Bill Buckley's son was a child, he shunned books. Happily, he outgrew that phase, and so came to read Radical Chic & Mau-Mauing the Flak Catchers, Tom Wolfe's brilliant takedown of limousine liberals. That was the book that most influenced him, Buckley declares; indeed, it was Wolfe "who made so many of my generation want to be writers in the first place." In singling out Darkness at Noon for acclaim, Elliott Abrams cites a novel that stirred me as well when I read it in my teens. Arthur Koestler's masterpiece describes the arrest and trial of a leading Bolshevik official during the Stalinist purges of the 1930s, explaining in the process how sane and loyal Communists could, as Abrams puts it, "commit such vast crimes, decade after decade." Today Stalin and the Soviet Union are no more. But totalitarian fanatics will always exist, and will always believe that their radical ends justify any means, however monstrous. Koestler never heard of ISIS or Al-Qaeda, but "Darkness at Noon" is about them too. National Review's 60th birthday is a milestone not just for a magazine, but for an ongoing commitment to the conviction that ideas matter, and that good writing can change lives. Its longtime readers have much to be thankful for. Of course, conservatives always do. 'Like' Jeff Jacoby's column on Facebook.